For fans of Pretty Little Liars, Little Monsters is a new psychological thriller, from the author of The Darkest Corners, about appearances versus reality and the power of manipulation amongst teenage girls. 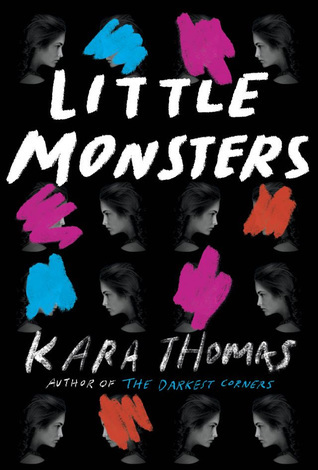 As a fan of mysteries and thrillers, I was excited to read Kara Thomas’s second psychological thriller, Little Monsters. This novel does not disappoint and it will keep you on the edge of your seat in anticipation. Kacey is new to Broken Falls. She’s sent to live with the father she never met and his blended family after everything escalates past the breaking point with her mother. One night, Kacey’s two new friends, Bailey and Jade, force her to sneak out with them to conduct a séance in a haunted barn. Her younger half-sister, Lauren, tags along by chance and ends up freaking out. After their failed séance attempt, the strangest thing happens. Bailey disappears, and Kacey knows it in her gut that she’s dead. As Kacey tries to figure out where Bailey is, darkness within in herself and those surrounding her begins to unravel. Since this is a thriller-type-mystery, I really do not want to spoil anything so I will keep this review short. The pacing of the novel is on the slower side, but I liked it this way because it really adds to intensity of Kacey trying to solve this mystery. There are no pop-out-to-scare-you moments. The most terrifying aspect is the darkness people are capable of acting upon. If anything, Kara’s prequel short story Wrath is the creepy story that will freak you out and leave you sleeping with the lights on. Throughout the novel, several of Bailey’s journal entries are woven in between Kacey’s narrative. I think these journals might be my favorite part. I loved seeing inside Bailey’s head and witnessing her dark descent. Watching her fixation on Kacey worsen was fascinating, and I eagerly awaited the next entry. By the time I read the last journal entry, my mouth had fallen open in shock, horror, and realization. Overall, Little Monsters is a fantastic thriller that will keep you on the edge of your seat gasping until the shocking final reveal. I`ve seen only positive reviews of this book and I`m really curious now. I am not the biggest fan of mystery, but the story does sound really good. Thanks, Faye! It really was a fantastic read! Now this does sound good, excellent review, this is going on my wish list! I hope you enjoy it as much as I did when you have the chance to read it! This is a really great thriller. Probably my favorite YA thriller of the year so far. It was so fascinating and had such great twists! Wonderful review! Thanks, Krysti! I think this was definitely one of my favorite reads of this year! I’ve heard so many positive reviews of this book, I can’t wait to read it myself! Thank you, Veronika!! I hope you enjoy it! You should also check out Jennifer Lynn Barnes’ The Naturals and The Fixer series if you are searching for some other good YA thrillers! I think I need to give this book a try. Haven’t heard much but the bits I did hear have been positive. Great review! I haven’t read many mystery thrillers but this definitely sounds like one I am going to check out 🙂 great review! Thanks, Megan! I hope you enjoy it as much as I did! Great review! I am looking forward to reading this one! Yay!! I hope you enjoy it!